The Honorable Robert M. Speer, acting Secretary of the U.S. Army, escorted by Brig. Gen. Jeff Broadwater, Commander of the National Training Center and Col. Joseph Clark, Commander of the 11th Armored Cavalry Regiment, walk through the mock village known as Razish, where role players engaged in the selling of goods and services, National Training Center, April 8, 2017. Robert M. Speer, acting secretary of the U.S. Army, visited the National Training Center at Fort Irwin, Calif., April 8, 2017, to observe readiness training in a realistic operational environment that simulates the conditions today’s U.S. Soldiers face in combat. 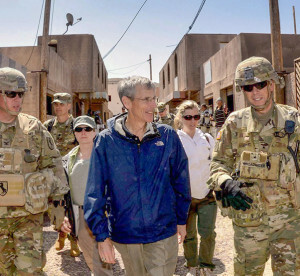 The Army’s top civilian began his visit at the National Urban Warfare Center (NUWC) located at Razish, where he witnessed the manipulation of the sights, sounds and smells within the town to mimic the conditions of a combat environment. After Speer and others had moved to an observation point within the town, an improvised explosive device was detonated, triggering a fierce fight between the 11th Armored Cavalry Regiment and a replicated guerrilla force. 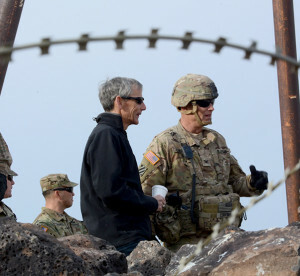 After the dust had settled, Speer engaged in one-on-one discussions with Soldiers of the 11th Armored Cavalry Regiment and distributed challenge coins. 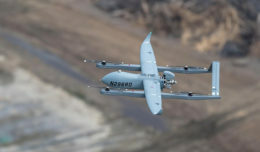 He then took a flight across the 1,200 square miles of austere terrain and toured infrastructure and live-fire training grounds. Speer then visited the 1st ABCT, 3rd Infantry Division, tactical operations center, and observed as they fought against the 11th Armored Cavalry Regiment, a world-class opposing force. 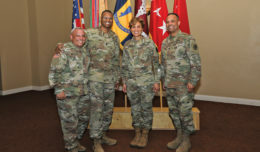 “It was a great opportunity for the acting Secretary of the Army to see up close and personal requirements needed to sustain training readiness for an armored brigade combat team,” said Col. Phil Brooks, commander of the 1st ABCT, 3rd Infantry Division. The Honorable Robert M. Speer, acting Secretary of the U.S. Army, with Col. Richard Coffman, Commander of Operations Group, observe an offensive engagement conducted by the 1st ABCT, 3rd Infantry Division, which included multiple M1 Abrams Battle Tanks and Bradley Fighting Vehicles against a replicated conventional force, the 11th Armored Cavalry Regiment’s visually modified HMMWVs with mounted anti-tank missiles, National Training Center, April 8, 2017. “The complexities at the National Training Center challenge our formations and leaders to ensure we are more than prepared, if and when [we’re] required to answer our nation’s call,” he added. 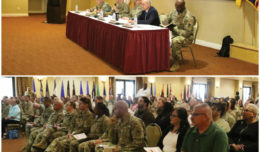 Later, Speer hosted a round-robin discussion, during which commanders of each observer controller team with Operations Group asked questions and raised concerns about the budget, personnel, and Objective-T, the Army’s uniform readiness evaluation system. Finally, Speer viewed an offensive engagement conducted by the 1st ABCT, 3rd Infantry Division, which involved pitting multiple M1 Abrams battle tanks and Bradley fighting vehicles against a replicated conventional force, the 11th Armored Cavalry Regiment’s visually modified Humvees with mounted anti-tank missiles.